For many organizations, the benefits of thin clients are well established. These devices allow organizations to deploy an endpoint that limits use to a task at hand, minimizes security issues, and in theory is more easily managed than a PC. In fact, traditional thin client vendors have made this argument explicitly: lower long-term management costs theoretically lower the total cost of ownership (TCO). As organizations move toward BYOD (bring your own device) and mobility solutions, the demand for a high performance, highly secure and easily manageable thin client is accelerating. Without it, customers considering VDI need to consider not only the high cost of the device, but also the continuing high cost of IT staff and management. 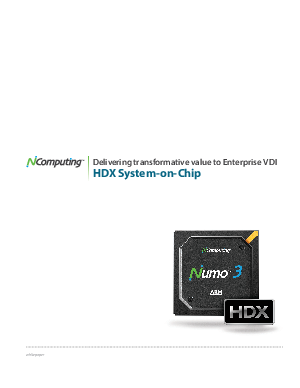 Download this white paper to read about how to best break through the long-running price/performance and manageability barriers to deliver a purpose-built endpoint solution for HDX: a challenge and opportunity for companies with a vision of allowing access to apps and data from anywhere from any device.